For the past year or so I have been using the 4 bay SATA hard drive dock shown above in my main hackintosh. Made by Icy Dock it works perfectly under Leopard and Snow Leopard, allowing SATA drives to be hot swapped. Over the past couple of months I bought two Icy Dock external USB2/eSATA drive enclosures for backup drives, shown below. I initially connected these drives using USB as the six Intel SATA ports on my motherboard were in use. The remaining two purple SATA ports are from the Gigabyte SATA2 chipset, a re-labelled JMicron controller. I hadn’t tried these, mostly due to remembered problems other users had way back in the early hackintosh days. Attempts using Superduper to make backups reported a transfer rate of 4Mb/second over USB2 so eSATA speeds were needed. The external Icy Dock cases come with an eSATA cable and expansion card socket/internal cable so there’s nothing else needed. A quick search showed that nothing was needed in the way of kernel extensions to get the jMicron ports working, so ten minutes of installing the expansion slot sockets and the external drives are now working fine over eSATA. Superduper is reporting around 60Mb/second transfer rate to the external backup drives so there’s no excuse to put off slow backups now. There shouldn’t be any speed difference between the internal 4 bay drives and the external ones, but the great thing about this setup is that the drive caddies are the same differing only in colour and air vent. I can remove an external white caddy and use it in the internal dock and vice versa. 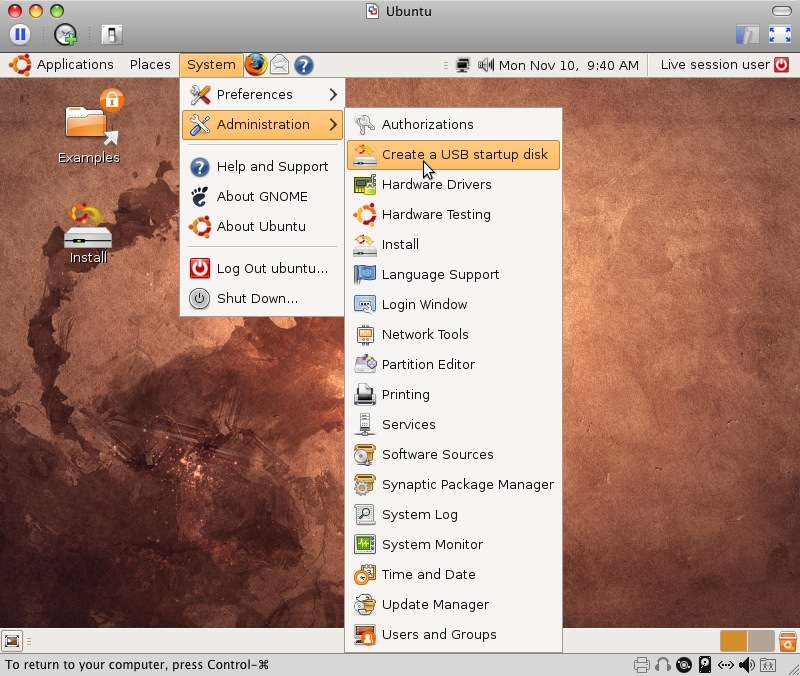 One of the features offered as part of the latest Ubuntu release is installation to a USB flash drive. This is a menu option from the Live CD in 8.10, under System>Administration. The ability to use a flash drive has been around in various forms for a while now, but as an occasional Linux user I haven’t seen it offered in this easy a package. If you use a Mac, making bootable backups are easy, and definitely easier than on a Windows Computer. Using software like Carbon Copy Cloner or Superduper you can clone your Mac’s hard drive to another internal or external USB/Firewire drive. This copy is an exact image of the original drive so you can boot from it and see no difference to using the source drive. Add in smart copies that only copy the changes since the last backup and you have a fast, reliable and easy backup system. Scheduled backups even mean you don’t have to remember to backup, just check it’s working as planed.